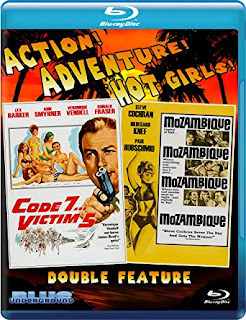 The good people at Blue Underground have rescued and restored a couple of early sixties genre movies in Code 7...Victim 5 and Mozambique, both produced by British indie filmmaker Harry Alan Towers as part of their "Double Feature" line of B movies. As far as I'm aware, both of these movies mark my first real exposure to Towers and his specific brand of schlock. Both films seem to be chasing the exotic location excitement of the James Bond movies, which were still fresh and new back in 1964, and both movies succeed at providing those elements by filming in South Africa. Unfortunately, there's not enough meat on the bones to really make for a totally satisfying movie experience, either. 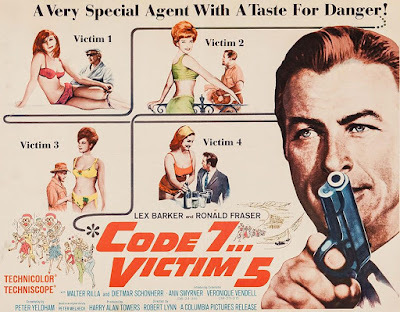 The tediously-titled Code 7...Victim 5 stars Lex Barker, one of the handful of actors to portray Tarzan on film, as a private investigator who ends up getting in over his head. That seems to have been a common theme for Harry Alan Towers: take a guy with a little bit of skill and throw him in over his head. Hey, it worked for all those noir films of the forties and fifties, and it kind of works here, too. In fact, both of these movies could be classified as "post-noir." Lex Barker is "Steve Martin," and I'll spare you the easy jokes about the characters name; what's important is that Barker is hired to investigate string of murders that might somehow be connected. Along for the ride is Danish actress Ann Smyrner (Journey to the Seventh Planet), Veronique Vendell (Barbarella), Ronald Fraser (The Flight of the Phoenix), classic Hollywood actor Walter Rilla (The Scarlet Pimpernell and Day of Anger), and Austrian actor Dietmar Schonherr, who also pops up in the other film on this disc, Mozambique. I won't get too deep into the plot because the story isn't really the selling point here. Honestly, I watched this movie a few days ago and the details are already fading from memory. This is more of a travelogue film than a story film, and it's best recommended for a lazy Sunday afternoon or a late night. There's very little in the way of character development, fight choreography, or actual intrigue. Really, the draw of Code 7...Victim 5 is the sights and sounds of the film. There are interesting beaches, perilous roads that are mere feet from cliff edges, large underground caverns, and beautiful mountain ranges. South Africa seems to offer a near-endless bevy of visually-interesting places for filmmakers to ply their trade, and Towers and company take full advantage. There's also a swinging jazz score that fits perfectly with the time that this movie was created. The music was composed by Johnny Douglas, a guy who most people my age will appreciate as having written most of the music for the Transformers cartoon in the mid-eighties as well as the Dungeons and Dragons animated series. Frankly, the score for Code 7 is good enough to listen to on its own, and I would gladly pick up a CD or vinyl release if one existed, but I don't think one does. The other film on the disc, Mozambique, is led Steve Cochran, a bona fide noir actor who appeared opposite James Cagney in 1949's White Heat. Cochran plays an out-of-work pilot who was the sole survivor of an airplane crash that occurred with him at the wheel. Now he's kicking around the beaches of Mozambique, South Africa, when trouble seems to find him. Just like with Code 7...Victim 9, there's a plot, but it's more of a vague outline than a tightly-scripted nail-biter. Somehow Cochran gets hired to fly some shady characters to pick up some cargo and is soon embroiled in a web of intrigue. See, that's the Harry Alan Towers formula at work again: normal guy with some skill, finds himself in over his head. In this film, Cochran is supported by Vivi Bach (Holiday in St. Tropez), the striking Hildegard Knef (Lulu), Martin Benson (Goldfinger), Paul Hubschmid (The Beast from 20,000 Fathoms), and Dietmar Schonherr, as previously mentioned. 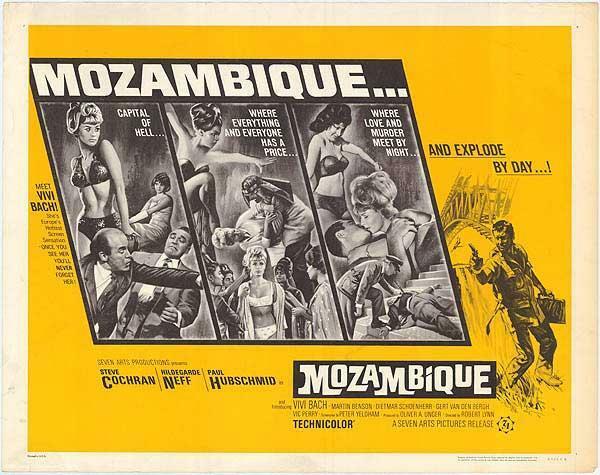 In my estimation, Mozambique succeeds more as a noir-inspired crime movie than at replicating the James Bond travelogue adventure that we got in Code 7...Victim 5. Here's a compliment for Towers and for Blue Underground's double feature pairing: while both movies on this Blu-ray may seem interchangeable at a glance, I think they actually feel different enough from each other to hold their own. Code 7 offers a swinging sixties good time with lots of women in bikinis and cool jazz. Mozambique is darker, has more of an edge, and probably has more substance. Johnny Douglas scores this movie too, but I find it to lack the charm of his compositions for Code 7...Victim 5. Still, there's nothing wrong with it, and it's serviceable. Both movies were produced with tight budgets, but the filmmakers (Towers and his director Robert Lynn, who helmed both flicks) wisely chose to put all the money they had on the screen. These movies really do look like a million bucks. The shortcomings are more apparent in the scope of the stories themselves and in their small casts. To be very clear, these genre movies were made to chase the popularity of a particular kind of movie. They were done very cheaply and very quickly, and they feel like it. However, I can't bring myself to really knock these films, because I had a good enough time watching them. They're the cinematic equivalent of a potato chip. They don't really stick with you, but they're fun while it lasts. They're perfect entertainment for when you want to turn your brain off and just vibe to a movie that requires absolutely nothing from you. For roughly 90 minutes, each movie will give you beautiful scenery, masculine men, attractive women, and that distinct sixties atmosphere. It's hard to necessarily recommend these movies because there's simply not a whole lot of substance, but it's also very hard to throw shade at them, too. They're fun to watch, but quickly forgotten. This might sound like a bad thing, but I don't think that it is. This double feature is like a little vacation for your mind, and it's hard not to appreciate what they offer.